These handmade forged bangles are made from 2mm silver; one bangle is left plain and the others are textured. 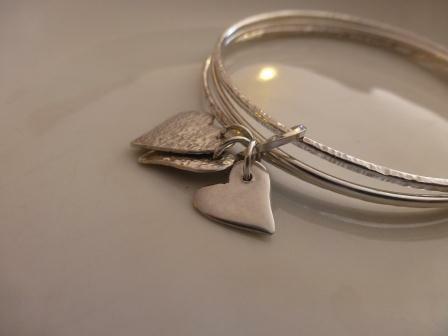 Hearts which echo the texture of the bangles are securely attached with a solid handmade jump ring. One or all can be oxidised. Hallmarked at the London Assay Office and it also includes my sponsors mark.